At one of our lunches, over a year before the eclipse, Ray Gardner asked me if I was going to go north to see the full eclipse. It was in July 1991 when Ray, Susie, Bill Bavinger, Roice, and myself went to Oaxaca in southern Mexico with Carolyn and Gary Sumners of the Houston Museum of Natural Science to see an eclipse at Monte Alban. It was a really neat experience, even though Roice got Montezuma’s revenge and spent a lot of time in the motel. I took an electronic surveying system with me. We surveyed the key corners of the ruins. Bill Bavinger had one of his students build a CAD model of the ruins at Monte Alban. Monte Alban was the center of the Zapotec culture from the first century B.C. to the 8th Century A.D. This overlaps the Book of Mormon time frames, and fascinated me. These ruins have the oldest Mayan calendar. They have Building J, which is shaped like an arrow, and points to where the monkeys on the calendar come from, which could be “the land of the first inheritance.” Gary took a 360o panorama photo from the center of the ruins. Carolyn and Gary created a show in the Burke Baker Planetarium based around this photo. The photo of the ruins came up all around the base of the planetarium. Then the photo faded into a line drawing of the ruins with all of the stars coming out like you see in a planetarium. Then the earth was taken back in time, and alignments between certain windows and certain viewing positions we identified were shown at the time the ruins were built. It was really fun. Ray and Suzie have gone on many eclipse trips, all over the world, since that trip in 1991. Paul independently asked if we were interested in seeing the eclipse. He has a friend with a cabin at the Palisades Reservoir in Southern Idaho, which was in the main path of the eclipse. Roice and Sarah, Sara and Tim, Rob, and Paul’s family all decided to join us on our eclipse trip. The images of “Tiny World” used for bulbs on the Christmas Tree in Song 008 – The Fallen Angel, were from Roice’s Tiny World movie of this eclipse. This was the first full solar eclipse in North America in 99 years. The regular video is on-line at this link, and the tiny planet video on-line at this link. 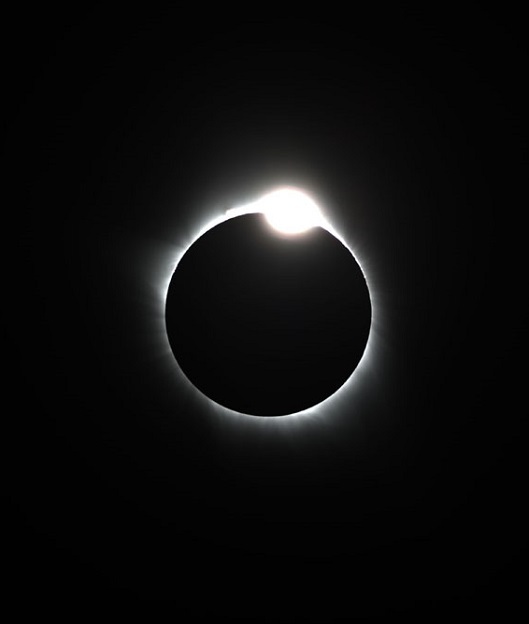 Even though the song does not mention the eclipse, because I got up early the morning of the eclipse, went outside (locked myself outside, slept in the back of the car for a while, and wrote the song) before anyone else was up, I loved our 2017 eclipse trip.